The unit at the end of Curiosity’s robot arm that scoops up sand and processes it through sieves experienced “an anomaly” on January 25, causing a halt in arm operations. The instrument has been scooping up sand from the sand dune that the rover has been studying recently. So far there has been no details at all about the “anomaly”, so it is unclear how serious the problem is. In the meantime the rover has been using its cameras and other instruments to do other observations. The competition heats up: The Russians successfully put a European commercial communications satellite into orbit today their Proton rocket. ILS owner Khrunichev State Research and Production Space Center of Moscow has said it would give ILS leeway to reduce prices to work its way back into the regular commercial-launch rotation alongside SpaceX and Europe’s Arianespace. The decline of the Russian ruble against the U.S. dollar has made that task easier as most commercial launch contracts are priced in dollars. In other words they are going to cut prices to compete, and the falling ruble has given them more leeway to do it. An evening pause: Hat tip Danae. The uncertainty of science: An analysis of data from New Horizons suggests that water ice is more widespread on Pluto’s surface than previously believed. The new map shows exposed water ice to be considerably more widespread across Pluto’s surface than was previously known — an important discovery. But despite its much greater sensitivity, the map still shows little or no water ice in the informally named places called Sputnik Planum (the left or western region of Pluto’s “heart”) and Lowell Regio (far north on the encounter hemisphere). This indicates that at least in these regions, Pluto’s icy bedrock is well hidden beneath a thick blanket of other ices such as methane, nitrogen and carbon monoxide. As the press release notes, water ice is actually “Pluto’s crustal ‘bedrock'”, so there really is plenty there. It is just buried below a surface of methane, nitrogen, and carbon monoxide “topsoil”. Below the fold is the podcast of my appearance on last night’s John Batchelor show. We talked about the Blue Origin flight last week, as well as the progress being made by SpaceX. I also discussed the lack of progress of Orion, while costing the taxpayers a lot of money. No settled science here: Three hundred climate scientists have signed a letter demanding that NOAA stop stonewalling the Congressioinal investigation of the agency’s repeated adjustments to raw climate data so that the record shows increased warming, when there is none. Of the 300 letter signers, 150 had doctorates in a related field. Signers also included: 25 climate or atmospheric scientists, 23 geologists, 18 meteorologists, 51 engineers, 74 physicists, 20 chemists and 12 economists. Additionally, one signer was a Nobel Prize winning physicist and two were astronauts. Seems to me that this letter and the number of climate scientists willing to sign it alone demonstrates that the “97 percent consensus” on global warming is bogus. As for NOAA, the agency is legally in violation of the law by refusing to provide information requested by Congress. Moreover, what are they afraid of? If they haven’t been tampering with the data improperly, they should have no reason to resist the congressional investigation. That they are stonewalling it suggests that they are hiding something. It also suggests that they haven’t the faintest idea what the scientific method is, which requires total transparency so that others can check the results and make sure they are correct. Finding out what’s in it: Independent studies have found that the average cost for health insurance under Obamacare in 2016 will be about $300 a month for the program’s silver plan. That’s not the biggest problem, according to analysts. For many, their health insurance has dramatically changed under Obamacare. Deductibles and out of pocket expenses are higher, so many of their medical expenses are no longer covered. Some consumers who say they had good, affordable plans prior to the Affordable Care Act say they can no longer afford the new plans, which are substandard in terms of what they cover. Obviously, this means the voters should throw their support to the Democratic Party and any one of their presidential candidates, all of whom have promised to fix this disaster of a law with even more government-imposed rules. The Dawn science team has released a new animation using the images taken by the spacecraft. The colors have been enhanced to emphasize the geological differences on the surface. I have embedded it below the fold. The movie was produced by members of Dawn’s framing camera team at the German Aerospace Center, DLR, using images from Dawn’s high-altitude mapping orbit. During that phase of the mission, which lasted from August to October 2015, the spacecraft circled Ceres at an altitude of about 900 miles (1,450 kilometers). The competition heats up? Airbus Safran and the European Space Agency have settled on the design of their next generation rocket, Ariane 6. It will not be re-usable, and though they say it will be 40-50% cheaper to produce than Ariane 5, it is very clear from the quotes in the article that they are instead depending on trade restrictions to maintain their European customers, even if it costs them a lot more to put satellites in orbit. For its part, Airbus Safran does not envisage making Ariane 6 recoverable, not in the short term. Mr Charmeau [the company’s CEO] believes that different market conditions apply in Europe and the US, which means there will not be a single, winner-takes-all approach. He cites, for example, the restricted procurement that exists in all major political blocs, which essentially bars foreign rockets from launching home institutional and government satellites. Nowhere is this more true than in the US, but in Europe too there is an “unwritten rule” that European states should use European rockets. From an American perspective this lazy attitude is fine with me. Let American companies compete aggressively. They will then leave the Europeans and everyone else in the dust. An evening pause: The following was a drill by South Korean police to practice the techniques they use to control demonstrations and riots. Anyone who knows anything about Roman military tactics will instantly recognize what they are doing. While this is not a real world situation, in an actual riot these techniques are certainly going to be effective. They also illustrate who is the civilized side in these disturbances. Fascists: A New York state court has decided that the state has the right to punish a couple who refused to allow a homosexual wedding on their private property. The court also sanctioned the state’s requirement that the couple submit to “re-education training” to learn the error of their ways. “After the agency ruled that the Giffords were guilty of ‘sexual orientation discrimination,’ it fined them $10,000, plus $3,000 in damages and ordered them to implement re-education training classes designed to contradict the couple’s religious beliefs about marriage,” a press release issued following the court decision stated. In order to comply with the order, the couple will have to attend those “re-training” classes or have a “trainer” come to them, according to ADF. The tyrants in the Soviet Union would be proud. New York is doing this kind of oppressive stuff as well as the communists did! A European experiment on ISS has found that fungi from Antarctica can survive in a Mars-like environment. For 18 months half of the Antarctic fungi were exposed to Mars-like conditions. More specifically, this is an atmosphere with 95% CO2, 1.6% argon, 0.15% oxygen, 2.7% nitrogen and 370 parts per million of H2O; and a pressure of 1,000 pascals. Through optical filters, samples were subjected to ultra-violet radiation as if on Mars (higher than 200 nanometres) and others to lower radiation, including separate control samples. “The most relevant outcome was that more than 60% of the cells of the endolithic communities studied remained intact after ‘exposure to Mars’, or rather, the stability of their cellular DNA was still high,” highlights Rosa de la Torre Noetzel from Spain’s National Institute of Aerospace Technology (INTA), co-researcher on the project. Does this prove that life exists on Mars? Not at all (though I wouldn’t be surprised if we see news articles in the mainstream press over the next week suggesting exactly that). It does show us once again that life is resilient and could develop in many very extreme environments. The competion heats up: Arianespace successfully placed a commercial communications satellite into geosynchronous orbit yesterday, its first launch of 2016. The competion heats up: The private company NanoRacks has proposed building a large airlock for ISS which could be used to launch private cubesates while also allowing NASA to eliminate spacewalks by bringing faulty equipment inside for repairs. For commercial opportunities, NanoRacks has a small satellite launcher, and it is also designing a “haybale” system to launch as many as 192 cubesats at a time. After the airlock is configured, it would be depressurized and sealed. Then a station robotic arm could grab it, move it away from the vehicle, and deploy its payloads. NASA is also interested in the opportunity to potentially fix large, external components of the space station. Before the space shuttle’s retirement, NASA used the sizable delivery vehicle to stash dozens of replacement pumps, storage tanks, controller boxes, batteries, and other equipment on the station, known as ORUs. When one of these components broke, astronauts would conduct a spacewalk to install a replacement unit. However sometimes the problem with a broken unit is relatively minor, such as a problematic circuit card. With a larger airlock, damaged components could be brought inside the station, assessed, and possibly fixed, saving NASA the expense of building and delivering a new unit to the station—or losing a valuable spare. Finally, the space agency could use the airlock to dispose of trash that accumulates on station and can be difficult to get rid of. It is exactly this kind of technology, spurred by the lure of profits, that interplanetary spaceships need if they are going to be maintainable far from home. On Wednesday, the military arrangement between the Air Force and ULA came under strong attack. First, Senator John McCain (R-Arizona) and House Majority Leader Kevin McCarthy (R-California) introduced a bill in Congress that would re-instate the ban on ULA’s use of Russian engines in the Atlas 5 rocket. The ban had been lifted when Senators Richard Shelby (R-Alabama) and Richard Durbin (D-Illinois) snuck language doing so into the giant omnibus budget bill in December. Second, at a hearing in the Senate on Wednesday, Air Force, under attack by Senator McCain for its sweetheart deal which gives ULA $800 million annually whether or not it launches anything regardless, admitted that it is thinking of terminating that deal early. The McCain bill is not likely to pass. However, the pressure he is putting on the Air Force, combined with the renewed and cheaper competition being offered by SpaceX, could very well lead to the ending of ULA’s EELV deal. I expect to see a similar scenario play out in connection with Orion/SLS sometime in the next two years. When SpaceX and others begin to fly manned capsules and big rockets for relatively little money, our elected officials are eventually going to notice how much more expensive that bloated government program is, even as it doesn’t accomplish much. Some of them will suddenly realize the political advantage in attacking SLS, and begin to do so. A computer program, dubbed AlphaGo, has successfully beaten a professional player of Go for the first time. The IBM chess computer Deep Blue, which famously beat grandmaster Garry Kasparov in 1997, was explicitly programmed to win at the game. But AlphaGo was not preprogrammed to play Go: rather, it learned using a general-purpose algorithm that allowed it to interpret the game’s patterns, in a similar way to how a DeepMind program learned to play 49 different arcade games2. This means that similar techniques could be applied to other AI domains that require recognition of complex patterns, long-term planning and decision-making, says Hassabis. “A lot of the things we’re trying to do in the world come under that rubric.” Examples are using medical images to make diagnoses or treatment plans, and improving climate-change models. If computer programs are now successfully able to learn and adapt it means that it will become increasingly difficult to distinguish between those programs and actual humans. The competition heats up: SpaceX and NASA on Wednesday released footage of a test of the parachutes for the company’s manned Dragon capsule. The footage and accompanying story revealed very little about the test, including when it actually happened, so it isn’t that much of a story. An evening pause: From the 1956 film High Society. And for my wife Diane today. While cable television and the general media goes nuts of the childish feud between Donald Trump and Fox News, Ted Cruz today got two different endorsements that not only supported his nomination for president, but also outlined in detail two completely different reasons for supporting him. The first, at the website Legal Insurrection, outlined Ted Cruz’s consistent and long term history as a trustworthy constitutional conservative. Not only does the article review Cruz’s history in the Senate, where he did whatever he could to fulfill his campaign promises (often prevented from doing so by his own Republican caucus), the article also looks at his background before becoming a senator. Its conclusion? Conservatives have been complaining for decades that they can’t get a reliable conservative nominated to run for president. With Cruz, we actually have that chance, and he will be running against the weakest Democratic candidate since George McGovern. The second article outlines Cruz’s particular advantages for cleaning out the bureaucratic corruption in the Justice Department and elsewhere in the federal government. The coming dark age: In his state of the state address on Monday the Democratic governor of Hawaii, David Ige, expressed weak support for the construction of the Thirty Meter Telescope (TMT) on the summit of Mauna Kea. “In its recent ruling, the Supreme Court did not say don’t do this project,” Governor Ige said. “What it did say was that the state didn’t do the right things in the approval process. It told us we needed to do a better job of listening to people and giving them a real opportunity to be heard. These are empty words. Listening to the protesters means the telescope doesn’t get built at all. The protesters made it very clear during their protesters this past year that their’ objective is to stop the telescope, to return to the illiterate native culture that existed before the arrival of the white man and his western civilization. They also made it clear that they are bigots, who want all not-native Hawaiians removed from the island. By saying he wants to “do a better job of listening” to them means that Ige is willing to go along with some of their ideas. Right now, I am very doubtful TMT will ever get built on Mauna Kea. An evening pause: Two things to note: First, they purposely knock the rings down periodically to show that they are not held up very firmly. Second, one of the musical pieces they play is the main theme from the film Exodus (1960). The score won an Oscar for Ernest Gold. He’s aggressive and anti-PC on the trail, in a knife fight with 15 other candidates, because that’s what it takes to win, but if winning at the job of the presidency requires a different tone, then that’s the tone he’ll take. This must be the first time in American history where it’s impossible to predict not only what a major-party frontrunner would do as president — given Trump’s volatile political history, all we can count on is that there’ll be “deals”. Be warned. Picking Trump as the Republican candidate for president might be the worse decision conservative voters ever made. He might be better than Clinton, but he certainly will not be what conservatives want. Posted from Tucson International Airport. I am on the way to very cold Michigan to give a lecture for the AIAA, and will be back Wednesday night.. The competition heats up: The Air Force has approved use of SpaceX’s upgraded Falcon 9 rocket for use in military launches. What this means is that SpaceX is increasingly considered an acceptable bidder for future military launch contracts. Moreover, it means that SpaceX will be able to use the Falcon 9 first stage that they are landing vertically, giving them more recoverable first stages for future flights. The competition heats up: Blue Origin expects to increase the rate of test flights for its New Shepard reusable rocket in 2016. I expect that by the end of 2016, the U.S. will have two proven reusable first stage rockets and two operational orbital cargo spacecraft. And that doesn’t count the likely first demo flight of Falcon Heavy. An evening pause: Hat tip Rocco. Cool image time! 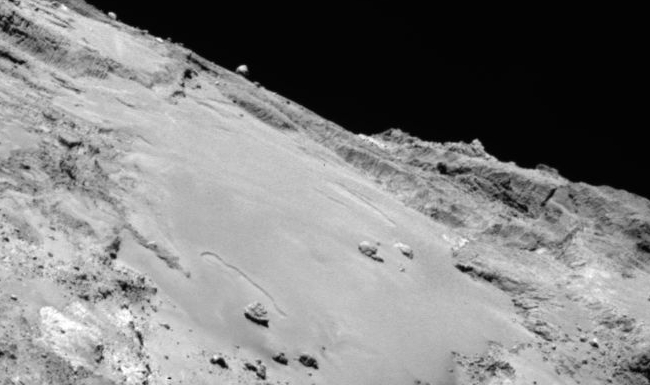 The Rosetta science team today released a spectacular image, taken by Rosetta’s high resolution camera, of the surface of Comet 67P/C-G. A cropped version is above and below the fold. A cropped version of the full image, focusing in on the smooth and active area dubbed Imhotep, is above. This smooth dusty terrain, which covers about 0.8 sq km, is etched with curvilinear features stretching hundreds of metres and which have been found to change in appearance over time. Many large boulders are also seen scattered within the smooth terrain, including the boulder Cheops in the foreground. Smaller but more numerous boulders are associated with exposed cliff faces and are most likely the product of erosion. In some debris falls, detailed analysis has revealed the presence of water ice. I have also included, below the fold, a second close-up crop from this same image, showing the layered cliffs to the left of Imhotep as well as several mysterious as-yet not understood round features at the cliff’s base. The coming dark age: The executive director of the Thirty Meter Telescope (TMT) on Friday made it clear that the future of the project in Hawaii is waiting on the state government. The excuse of Hawaii’s attorney general above is garbage. If the governor pushed, he could get the court to move. They are instead allowing the case to languish, which once again tells us that the sympathies of this liberal Democratic Party government lie entirely on the side of the protesters. The competition heats up: Blue Origin yesterday successfully re-flew its New Shepard booster, vertically landing it for the second time. Data from the November mission matched our preflight predictions closely, which made preparations for today’s re-flight relatively straightforward. The team replaced the crew capsule parachutes, replaced the pyro igniters, conducted functional and avionics checkouts, and made several software improvements, including a noteworthy one. Rather than the vehicle translating to land at the exact center of the pad, it now initially targets the center, but then sets down at a position of convenience on the pad, prioritizing vehicle attitude ahead of precise lateral positioning. It’s like a pilot lining up a plane with the centerline of the runway. If the plane is a few feet off center as you get close, you don’t swerve at the last minute to ensure hitting the exact mid-point. You just land a few feet left or right of the centerline. Our Monte Carlo sims of New Shepard landings show this new strategy increases margins, improving the vehicle’s ability to reject disturbances created by low-altitude winds. They are not clear whether the capsule was re-flown as well. They do say they intend to re-fly New Shepard many times in 2016, probably at an increasing rate. If so, I would say that the race to be the first to sell suborbital tickets to tourists is won by Blue Origin, and that Virgin Galactic and XCOR have been left in the dust. I have embedded the company’s video below the fold of yesterday’s flight. An evening pause: Stick with it, as they finish slightly early and need to improvise a bit at the end to fill time. The competition heats up: NASA’s decision to award Sierra Nevada a cargo contract has triggered a $36 million investment by the European Space Agency (ESA) to build a new docking unit for Dream Chaser at ISS. Sierra Nevada Corp.’s win of a NASA contract to ferry cargo to the International Space Station will trigger a $36 million investment by the 22-nation European Space Agency following a cooperation agreement to be signed in the coming weeks, ESA said. Once the agreement is signed, ESA will begin work building the first flight model of the International Berthing and Docking Mechanism (IBDM), which Sierra Nevada’s Dream Chaser Cargo System will use to attach itself to the space station. ESA said it would spend 33 million euros ($36 million) to complete the design of the IBDM and build a flight model for Dream Chaser’s first cargo run. Future IBDMs will be financed by Sierra Nevada, ESA said.